I have bobcat kits playing in my yard are they orphaned? Mother bobcats are single moms. They must protect their young from normal predators and adult male bobcats who will prey on the kits. She may have found that your yard was a safe place to leave her kits while she hunts for food. She is opportunistic which means she may hunt at night or day whenever the intended prey is available such as a squirrel, rabbit or rat. She could also be napping in the den or shade. The kits will be playful and adventurous. Often, they will venture out of the den as they get older. Don’t be alarmed. It is easy to discourage the mother from leaving her family in your yard with a humane eviction. Read the FAQ titled How to Humanely Evict a Coyote. Fox, or a Bobcat Family. The kit is continually vocalizing and wondering around in your yard. Fire ants or flies are present. You have observed a dead adult in your neighborhood. You are aware that an adult was trapped or killed in your neighborhood. You or your neighbor have used rat poison. The kit is lethargic and very thin. Eyes are closed, and the baby appears to have crawled out of a den. Observe for a couple of hours unless the animal is in distress. If warranted and you can safely do so, place an inverted laundry basket over the kit to contain, while you wait for the mother to retrieve. If the mother bobcat does not retrieve the young kit, consult with the hotline and or a wildlife rehabilitator specializing in bobcats. It is important to keep wild babies with their family. Unfortunately, humans can cause disruption of the family by trapping, killing, and or by hitting with an automobile. I found an injured bobcat! I saw a wild animal such as a raccoon, skunk, fox, coyote, or bobcat during the day, should I be concerned? Nocturnal wildlife will, on occasion, forage during the day. This is common with lactating mothers or wildlife that have been accustomed to dining on reliable resources of pet food. If you observe a wild animal traveling from point A to point B, this would be considered normal healthy behavior. Behavior to be concerned with is an animal that is lingering and not aware of the dogs or humans nearby. Out during the day. The difference is the animal is just lying in the yard and does not care what is happening around them such as barking dogs or people. Dragging hind legs, twitching, seizures, symptoms of the nervous system. Matted eyes, or nasal discharge. These symptoms can also be rabies. In Texas, there are very few incidences of rabies in the raccoon, coyote, fox, or bobcat however eastern states do report a greater incidence of rabies in the raccoon. In the DFW area, we see an occasional skunk with rabies. A sick animal needs to be removed by your city animal services and euthanized. Distemper is not curable. As the sick animal lingers, it spreads the air borne virus. Animals with distemper can spread it to others 12-15 feet away. Removal protects the rest of the wildlife. Most wildlife rehabilitators do not have the resources to euthanize for the public, as well, do not want to introduce viruses to the animals in their care. People can not contract distemper. Please do not feed wildlife such as raccoons. The transmission of distemper usually occurs when someone is intentionally feeding, and unrelated raccoons dine together. The results are devastating as neighborhood populations die off. Show respect by not feeding wildlife. Should I be worried about a bobcat in my neighborhood? Seeing a bobcat in your neighborhood affects everyone differently. 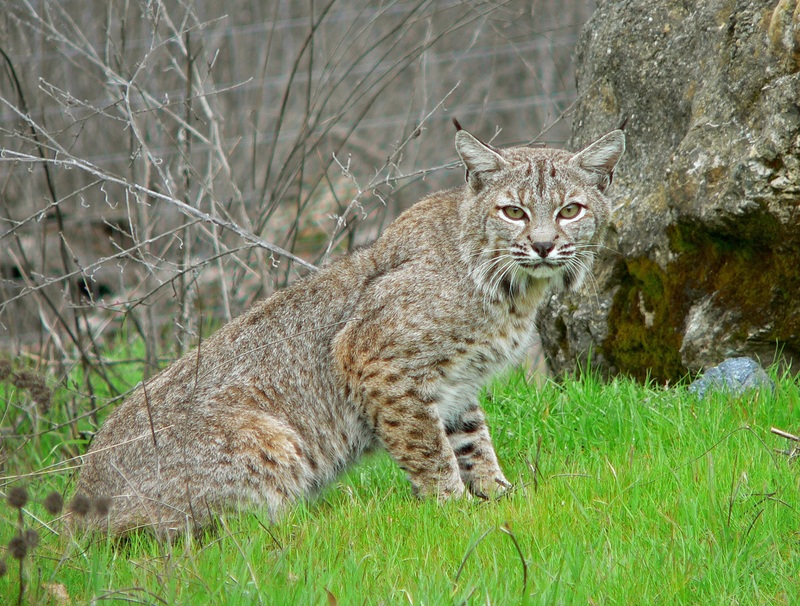 Through education, fear can be replaced with an understanding of the bobcat and its role in our cities. A healthy environment has a balance of predator and prey. Bobcats are keeping the rodent and rabbit population in balance. Bobcats are not a threat to humans. Helpful Hints on Co-Existing with Bobcats. First rule: NEVER FEED WILDLIFE! Manage your pets. Pets the size of a rabbit or smaller, are considered prey for a bobcat, coyote, hawk, owl, and others. Bobcats need to remain afraid of humans. Anytime you see a bobcat, make it a negative experience for the bobcat. Shouting, hitting pots and pans, throw a rock, and/or squirt water from a hose are a few hazing techniques to use. Bobcats naturally avoid humans, by hazing, you prevent the bobcat from becoming too comfortable in our yards. When jogging or walking, simply raise your arms to appear larger and yell forcefully while looking directly at the bobcat is the simplest way to haze. You may also carry a bicycle horn, whistle or other noise maker to scare the bobcat. Never run from a bobcat, as this can encourage chasing. Remember stand tall, yell, and look directly at the bobcat. Never corner a wild animal. Always provide an exit for the animal. Never try to touch a wild animal. You are jeopardizing your safety and the animal’s life. Bobcats are not known to attack humans. Bobcats are naturally fearful of humans… let’s keep it that way! Additional information on co-existing or discouraging wildlife activity is located in the following FAQ: Basic Conflict Resolution of our Urban Predators. Share the message of co-existence with your neighbors. Together, you can enjoy the benefits of wildlife and reduce the conflicts. Below is a link demonstrating hazing of a coyote. The procedure is the same for a bobcat. Please watch the informative video of the study of urban bobcats here in the Dallas Fort Worth Metroplex. Ways to discourage wildlife in my yard. First an understanding of why we have wildlife in our cities. As our cities encroached on fields and woods the wildlife adapted. Our greenbelts and water features in our planned communities, provide shelter, water, and a place to hunt. The wildlife moves around our cities freely, utilizing our creeks/streams, greenbelts, and storm drainage systems. Further adaptions were made as smaller territories were required as an alternative food supply of garbage was consumed instead of exclusively hunting. Den choices became plentiful as wildlife discovered our homes/decks were great dens. Two species who have adapted extremely well are the raccoon and opossum. Their populations in the cities are known to be 5 to 8 times greater than their country counterpart. Mammal predators in our cities include, bobcats, coyotes, and to a lesser degree raccoons, foxes, skunks and opossums. Their diets consist of a wide range of insects, lizards, frogs, snakes, mice, rats, rabbits, squirrels, and ducks. All except the bobcat are omnivores which extends their diet to also include plants such as fruits, berries, and nuts. A quick look around in your neighborhood, you will understand there is plenty of food. We have made those food sources even denser with accessible dumpsters and feeding of wildlife such as ducks at the park, bird or squirrel feeders in our yards. In fact, food is so plentiful that hunting is not always a requirement when you can quickly dive into a dumpster and dine on our leftovers. Life in the cities is indeed easier for the wildlife. It is understandable that wildlife and humans will have conflicts. As we learned to live with our wild neighbors, studies have revealed that traditional trapping of wildlife does not solve the urban wildlife conflict. With abundant resources of food, water, and shelter the remaining animals will absorb that vacant territory in a very short time. In many cases, such as the coyote, when a resident pair are removed the surrounding coyotes absorb the vacant territory allowing for the success of larger litters. The results are a larger coyote population than prior to removal. Studies also reveal that relocated trapped animals seldom survive, as most are territorial. Another consideration for trapping and relocating is to keep the predator prey balance. When this delicate balance is disturbed there is an increase in rodent, rabbit, and deer populations. Increased rodent population can be a public health risk. To effectively resolve wildlife conflicts long term, address the basic needs of life; food, water, and shelter. If you want to feed the birds, please put a day’s portion of seed when you can enjoy the songbirds. An overflowing bird feeder attracts rodents, rabbits, and squirrels. The prey eating the seed on the ground attracts the opossum, raccoon, skunk, bobcat, fox, or coyote. You are responsible for creating this food chain in your backyard. Don’t allow fruit, acorns, and nuts to accumulate. Place your garbage out the morning of pick up. If you must place out the night before, put half a cup of ammonia in the can to discourage rummaging. Keep dumpster doors and lids closed. Consider purchasing animal proof containers. (see our PRODUCTS PAGE in the upper right menu) Place your containers away from walls or fences to discourage access. Do not keep pet food out. If you must feed your dog outside, please pick up any remaining food after 20-30 minutes. Consider feeding indoors to prevent fire ants and flies in your pet’s food. When feeding feral cats, put out enough food for the cats, remove any food not eaten within a short-designated time. Any time wildlife joins the feeding, alter the time so that the raccoons, opossums, etc. arrive late for the buffet. Do not store pet food or seeds in your garage or out buildings unless secured in a container that cannot be opened or chewed. Compost. Don’t put food scraps in your compost pile. When using a compost bin keep the doors closed. Manage pets. Coyotes, bobcats, hawks, and owls consider our small pets (rabbit size or smaller) to be fair prey. We must be responsible for their safety when outdoors. When walking, keep your pet on a six-foot leash. Small pets should be housed inside. Vaccinate your pets annually. Keep cats indoors, as there are multiple dangers in our communities such as cars, disease, cat fights, dogs, hawks, owls, coyotes and bobcats. Cats are the major cause of song birds, rabbits, baby opossums, and baby squirrels’ admissions to a wildlife rehabilitator. Water your lawns during the day. Adjust sprinkler systems to prevent pooling of water. The use of motion detector devices using either/or a combination of light, sound, and water can reduce visits to your pools or ponds. Visit our PRODUCTS PAGE (located in the upper right of the menu) for several recommended deterrents. Shopping on our site, supports the hotline. Avoid allowing landscape to become overgrown. Trim overhanging limbs to discourage roof access. Thin brushy areas. Keep your grass maintained. Don’t keep junk piles or accumulate debris. Compost piles create heat that could attract wildlife seeking shelter from the cold. If using a bin keep the doors closed. Seal areas and/or correct any erosion that could become den sites under a storage shed, a deck, or under a pier and beam home. For pier and beam homes check your foundation vents and replace with a sturdy hardware cloth to prevent entry. Decks should be constructed so that wildlife cannot get under. The base can be wood, rock, brick or hardware cloth to ground level. To prevent digging bury wire from the base “L” shaped attached at a 45-degree angle with the base extending at least 12 inches away from the sides. The 12 inches will discourage digging. Buried depth is recommended to be 4 to 6 inches. Cap your chimney. Keep your roof and eaves in good repair to prevent entry by rodents, squirrels, or raccoons. Our urban predators are naturally fearful of humans. Don’t allow a food source to create a conflict inviting unnatural behavior from your wild neighbors. Teach children to respect and never approach or touch wildlife. Explain the wildlife’s role in our cities and to always get an adult to help if wildlife is in need. Small children should always be supervised as there are many dangers in our cities. Share this information with your neighbors, family and friends. Through education and responsible behavior, wildlife and humans can coexist in our cities. How to humanely evict a coyote, fox, or a bobcat family. If you have a wild neighbor, such as a coyote, fox or bobcat occupying your yard or under your deck or storage building, it is easy to encourage them to relocate. Trapping is not recommended for many reasons. Babies can be left behind. Coyotes and foxes’ mate for life. Both parents participate in caring for the young. It is difficult to trap a whole family. The bobcat is a single mother as the male will kill the kits. Territorial animals rarely survive relocation, especially a wild mother with babies. Depending on the mobility of the young the mother may be forced to abandon her babies. Stress of relocation can cause her to abandon the young. The resident wildlife may feel threaten and kill the defenseless young. Relocation contributes to the spread of disease such as rabies, canine distemper or panleukopenia. There are state laws restricting the relocation of some wildlife. Eviction is a simpler solution. Requires no relocation. Family will remain intact. With deterrents you encourage the foxes, coyotes, or bobcat to vacate the den. The young are taken with the mother either immediately or over a night or two depending on the number of young and size. Eviction is the most humane solution and wild babies stay with their parents. Often the discovery of the den is enough for the parents to move the family. If it has been a few days since you discovered the family, some encouragement may be required. An eviction must be deployed at dusk. This is when the parents become active and leave the den to hunt. Upon leaving the den, if they feel a threat to their young family they will begin relocating. A special note, if there are adverse weather conditions that may limit the mother’s activity, wait to begin the eviction as you do not want the mother to become accustom to the deterrents. Deterrents target the senses: sight, smell, and sound. The deterrents (light, radio, and Apple Cider vinegar) are turned on at dusk and off at day break. Do not leave on during the day, as the parents will get accustom and determine there is not a threat. Day one at dusk, leave lights on in the yard. Depending on the location, you may need to use additional lighting such as a utility light with a clamp (extension cord, if needed) to flood the den site with light. Often this may be enough deterrent. Adding a portable radio on a 24-hour Rap music or Talk station near the den, creates an additional threat to the family. Place Apple Cider vinegar on some rags around the den opening. Turn deterrents off the morning of day two. If you are unsure that the family moved, repeat deterrents at dusk again. On the morning of day two or three (depending on when you believe the family departed) turn the deterrents off. Seal the entry of the den with newspaper, plastic garbage bag taped to the edges, or other barrier that can be easily removed by the animals if they are still in the den. The purpose is not to trap. The goal is to determine if any animals are still using the den. Monitor for activity at least 24 hours. If after 24 hours the opening is still sealed as you left it, proceed with permanent repair to prevent another family from taking up residency. A minimum repair would entail hardware cloth applied to the opening and secured with a 1-inch sturdy staple. Don’t kid yourself that another animal won’t occupy the abandoned den! If the den was under a deck, you should install a skirt to prevent future entry. Read FAQ: “How to prevent raccoons from finding shelter on your property or home”. If you are having difficulty or need advice, please contact the wildlife hotline. If you want to hire professional the hotline can provide referral for a humane exclusion company. If you suspect the mother left a baby behind, call the hotline before you act. Deterrents work. A humane eviction prevents orphaning. Remember to maintain your homes and yards to discourage unwanted wildlife. To discourage wildlife on your property read FAQ: “Basic Conflict Resolution of our Urban Predators”.